The Iron Ship grabs your attention from the prologue’s first paragraph. The descriptions of a barren land of buried roads, volcanic glass obelisks, rustless metal ruins, and undiscovered artifacts tantalizing. When a lone woman treks across this Red Expanse to a hidden temple where her forgotten god and his sacred rites are revealed, the anticipation of ominous, wonderful things to come only grows. Even when the priestess gives way to a Guider named Aarin Kressid making his way along the Paths of the Dead in Karsa City, the story loses none of its charm, as the vision of a world ruled by the Great Tide, islands of floatstone riding upon its crest, and a “priest” raising dead spirits seamlessly assumes the spotlight. At this point, the novel seemed to be a dream come true for a fantasy fan like me who was craving something familiar, yet wonderfully different. This world a grand fusion of primitive sorcery and magic-powered science, ancient history and modern mysteries, medieval upper class and growing bourgeois that was amazingly addictive. But then something happened: Nothing. “Nothing.” It is an ominous word when used to describe certain things. When a person asks how much money they have in their bank account and the answer is “nothing” that is definitely a bad thing. Similarly, when speaking of the story line in a book, the idea that “nothing” happens with the plot is not a good thing. And, unfortunately, in The Iron Ship, nothing much happens after that amazing beginning; an occurrence that is terribly disappointing. Now, to be fair, some things do happen in the book. I mean, it doesn’t spin its wheels for hundreds of pages, after all. And K.M. McKinley does nurture a few story elements into very interesting epic fantasy faire. One of those is the cast of memorable characters; the majority of which are the Kressid siblings. There is the already mentioned Aarid Kressid, who guides spirits to the afterworld; Trassan Kressid, an engineer of immense skill who is building the iron ship herself; Guis Kressid, a playwright haunted by dark magic and personal mental illness; Rel Kressid, a roguish soldier banished to the edge of civilization for impropriety; Katriona Kressid, a brilliant woman trying to use her business skills in a male-dominated society; and Garten Kressid, the dedicated family man and bureaucrat. Joining them are others, such as the living god of wine, Elturion, the Hag of Mogawn, and her loyal servant Mansanio. All of them taking their turns as the central focus of the narrative; their personal struggles adding layer upon layer to this story of a magical world going through the birthing pains of an industrial revolution. The other is that amazing world, which I’ve just mentioned. Modern and ancient, magic and science co-existing side by side. A vast land dominated by the Great Tide, but not solely about it. Culture after culture mentioned in passing. Social change and class upheaval clearly suggested, as brewing problems lying right below the surface. And numerous mentions of past civilizations that have disappeared, must now be rediscovered, and which might hold the keys to unlocking a growing mystery. No matter those stellar elements, however, The Iron Ship was a very frustrating novel for me. Every single story line, every character’s personal plot reading like foreshadowing of future events. The book quickly turning into one long prologue, one huge buildup to the next book of the series. Not that I expected the story to be wrapped up in a single volume (This isn’t a standalone novel. ), but it would have been nice if something, anything had been resolved. Nothing was, however, and that disappointed me immensely. Does that mean I won’t read the next book of the series? No, it doesn’t. Actually, I fully intend to pick it up. The foundations of this world and its cast of colorful characters have too much potential for me to cast aside The Gates of the World series that easily. But K.M. McKinley definitely needs to reward my perseverance with more resolutions and less foreshadowing in book two. This book was provided to me by Rebellion and Netgalley in exchange for a fair review. The above review is my personal opinions of this novel and was not influenced by anyone else. This entry was posted in 3 Stars, Epic, Fantasy, High and tagged epic fantasy with technology, fantasy books with science, K.M. 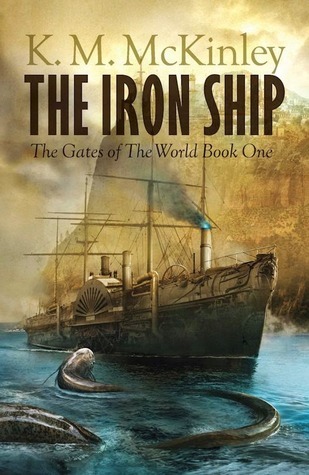 McKinley, The Gates of the World, The Iron Ship. Bookmark the permalink. The world does sound awesome, and seems like she built a good foundation for the story, but I think I’ll wait to see how book 2 turns out. It might be wiser to wait and read the books back-to-back. That way the feeling of nothing happening wouldn’t feel so ominous, I imagine.